Non-Powered Soft Convenience Amethyst Pillow from Healthy Line is ideal for head, neck, and lower back support. Non-powered and non-heated for maximum user safety, the amethyst pillow from Healthy Line is made with some of the highest-quality amethyst found in northern China near the world’s biggest mines. Our raw amethyst stones are then put through a seven-stage quality control process and officially registered with the FDA, FCC, and CE. The amethyst stones in Healthy Line’s Non-Powered Soft Convenience Amethyst Pillow help your body achieve natural healing comfort. Our stones are certified by many respected U.S. laboratories, and amethyst crystal therapy has been used by doctors and recognized by scientists for centuries. 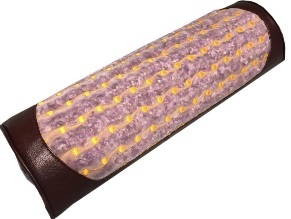 Amethyst crystal therapy is a safe therapy choice for both short-term and long-term use, making Healthy Line’s Non-Powered Soft Convenience Amethyst Pillow a very non-demanding way for your body to receive the healing benefits of amethyst. Because amethyst is a type of quartz, it instantly doubles the area occupied by a person’s biomagnetic field, energizing and revitalizing your body and creating a general sense of well-being. The healing powers of Healthy Line’s Non-Powered Soft Convenience Amethyst Pillow rejuvenate your body from the inside out to improve your physical and mental health. Years of research prove that amethyst crystal therapy is a safe, effective, and scientifically validated alternative to traditional pharmaceutical treatments. Amethyst has been shown to provide healing benefits for everything from insomnia to infertility. It can also increase mental clarity, alertness, and creativity and bring feelings of relaxation and peace of mind. Health and comfort don’t have to come in a prescription bottle. Pick up a Healthy Line pillow and see for yourself!